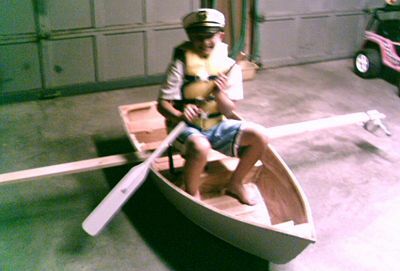 Dear Sirs, I have constructed this little boat from your excellent plans, and it has been a fun summer project for me and my 10 year old grandson. However, to make it usable in our neighborhood pond, I had to make a modification which might interest you. It is laterally as unstable as a canoe, so a simple outrigger with a 2-liter bottle duct taped to each end as pontoon works very well.